In addition to creating an atmosphere of excitement and team spirit, the Trax Tires community (called JagTrax) offers a way to reward those who have given back to the city of Mobile. Each week, the winning organization wins game tickets and more plus a chance to hang out at the JagTrax with company reps and others. 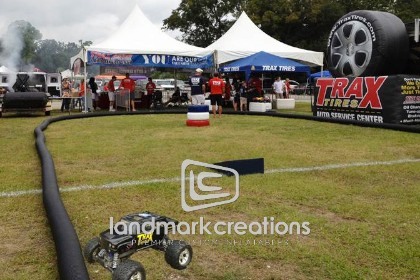 Fellow Jaguars fans can stop by for food and t-shirts, and to try their hand at racing the RC monster truck around its course. The entire time the Trax inflatable billboard is front and center to help reinforce branding. Kimberly McKeand, Marketing Director of Trax Tires, told us, "So far we have received a lot of positive feedback from people in our community saying that they love [our inflatable billboard]. We hope people will see our inflatable tire and remember our name when it comes time for them to purchase tires or have their vehicles serviced." After all, that's the name of the game… make a lasting impression that brings customers to your door. Looking for more creative automotive marketing ideas? Visit our online galleries!